The Superman Fan Podcast: Episode #383 Part II: Superman Comic Book Cover Dated June 1965: 80 Page Giant #11! 80 Page Giant 11, June 1965! Download Episode 383 Part II! 80 PAGE GIANT 11, June 1965, was published on April 15, 1965. As the title indicates, it contained 80 pages for the cover price of a quarter. Mort Weisinger was the editor, and the cover was pencilled by Curt Swan and inked by George Klein. - (4:37) THE KRYPTONITE MAN (13 pgs. ), written by Otto Binder and drawn by Al Plastino. This story was originally published in ACTION COMICS 249, February 1959, released on December 30, 1958, containing 32 pages for the cover price of 10¢. It was also reprinted in SHOWCASE PRESENTS: SUPERMAN vol. I and SUPERMAN: THE MAN OF TOMORROW ARCHIVE vol. II. We covered this story back in Episode 182, for the week of June 8, 2011. - (19:19) THE IMPOSSIBLE MISSION (7 pgs. ), written by Jerry Siegel and drawn by George Papp. This is Siegel's 89th silver age Superman story we've covered for the podcast and his 143rd for the era. The story was originally published in SUPERBOY 85, December 1960, released on October 6, 1960. It contained 32 pages for the cover price of 10¢. It was also reprinted in SUPERMAN IN THE SIXTIES and SUPERMAN: PAST AND FUTURE. - (30:13) THE TERRIBLE TRIO (10 pgs. ), written by William Woolfolk, pencilled by Wayne Boring and inked by Stan Kaye. This story was originally published in SUPERBOY 88, March 1954, released around January 27, 1954. It contained 32 pages for the cover price of 10¢.This story was also reprinted in SUPERMAN FROM THE THIRTIES TO THE SEVENTIES and SUPERMAN FROM THE 30'S TO THE 80'S. - (47:31) THE CONQUEST OF SUPERMAN (12 pgs. ), written by Bill Finger, pencilled by Curt Swan and inked by John Forte. It was originally published in ACTION COMICS 277, June 1961, released on April 27, 1961. It contained 32 pages for the cover price of 10¢. This story was also reprinted in BEST OF DC 16, September 1981, published on June 4, 1981. It contained 100 pages for the cover price of 95¢. It was also reprinted in SHOWCASE PRESENTS: SUPERMAN vol. III and THE GREATEST TEAM-UP STORIES EVER TOLD. We covered this story in Episode 244 for the week of October 17, 2012. - (1:01:29) THE ARMY OF LIVING KRYPTONITE MEN (8 pgs. ), written by Jerry Siegel and drawn by George Papp. This was Siegel's 90th silver age Superman Family story, and his 144th overall for the era. The story was originally published in SUPERBOY 86, January 1961, released on November 22, 1960. It was also reprinted in ADVENTURE COMICS 492, October 1982, published on July 1, 1982. It contained 100 pages for the cover price of $1.25. This story was also reprinted in LEGION OF SUPER-HEROES ARCHIVE vol. I, SUPERMAN VS LEX LUTHOR and SHOWCASE PRESENTS: LEGION OF SUPER-HEROES vol. I. - (1:24:05) THE CURSE OF LENA THORUL (8 pgs. ), written by Jerry Siegel and drawn by Kurt Schaffenberger. This story was originally published in SUPERMAN'S GIRL FRIEND LOIS LANE 23, February 1961, released on December 22, 1960. It contained 32 pages for the cover price of 10¢. This issue had a circulation of 458,000. This story was also reprinted in SHOWCASE PRESENTS: SUPERMAN FAMILY vol. II. We first covered this story in Episode 321 Part II, for the week of May 27, 2015. Also highlighted in this episode are the ads and other features. Next Episodes: SUPERMAN COMIC BOOKS COVER DATED JUNE 1965: PART III: ACTION COMICS 325 & PART IV: WORLD'S FINEST COMICS 150, with the ELSEWHERE IN DC COMICS segment, according to Mike's Amazing World Of DC Comics, at the end of the episode. Then we will feature: SUPERMAN COMIC BOOKS COVER DATED JULY 1965: PART I: SUPERMAN 178, PART II: SUPERMAN'S GIRL FRIEND LOIS LANE 58, PART III: ACTION COMICS 326 & PART IV: SUPERMAN'S PAL JIMMY OLSEN 86! I always loved the 80 Page Giants! So many stories for just over the price of two regular comics, and, for many of us, the stories were old enough that they were "new to us". I think, though, in this case, I was old enough that I remembered some (but not all: "The Terrible Trio" was published before I was born.) of these stories from previous comics I'd read. I especially loved the "themes" that these 80 Page Giants usually used, in this case, "The Greatest Luthor-Superman Duels". I've always been a big fan of Lex Luthor as one of Superman's greatest adversaries, but not purely evil in all cases, as we see in some of the stories in this issue. For instance, in "The Impossible Mission", we see Luthor's profound regret for the role he played in Lincoln's death (even though, by the DC Silver Age rule that no one could change history, he really wasn't responsible. Also, in "The Curse of Lena Thorul", we see his great love for his younger sister, and how important it is to him that she never discover her relationship to a criminal like him. Keeping that secret from her (by Superman, Supergirl, and Lois) became an ongoing story point through the Silver Age and into the Bronze Age. I do want to mention two story points in particular from this 80 Page Giant. 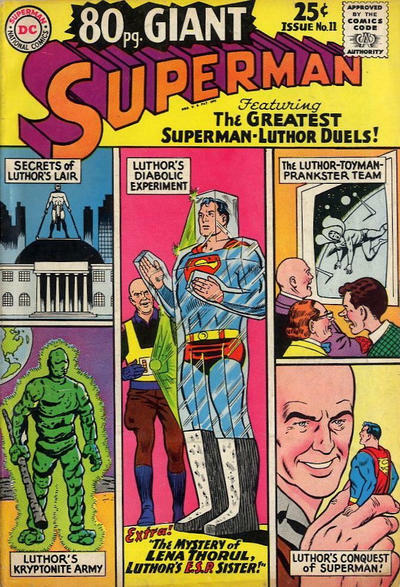 I really enjoyed Luthor's Lair in "The Conquest of Superman", and I wish we readers had gotten to see it more often. I think it only made one or two more appearances. Also, in "The Kryptonite Man", the second suit of lead armor that Superman makes, the one with the TV camera, has a TV antenna on the top. The camera and monitor should be a closed-circuit system, not a broadcast system, so no antenna should be necessary, …, unless Superman wanted to watch Have Gun, Will Travelwhile battling Luthor. I think we got another look at a different Luthor’s Lair in Superman #167 when Lex teamed up with Brainiac. In that issue the hideout was in an astronomical observatory, which was set up just like the museum lair.